It&apos;s the most wonderful time of the year — the time of all-Christmas music, all the time. Though radio stations around the country are committed to finding all the Christmas music that&apos;s fit to spin, some people are actively seeking out Christmas music on their own. And one state is more eager for Christmas music than all the rest: Utah. According to statistics released by Pandora, Utah streams more Christmas music than any other state in the union. 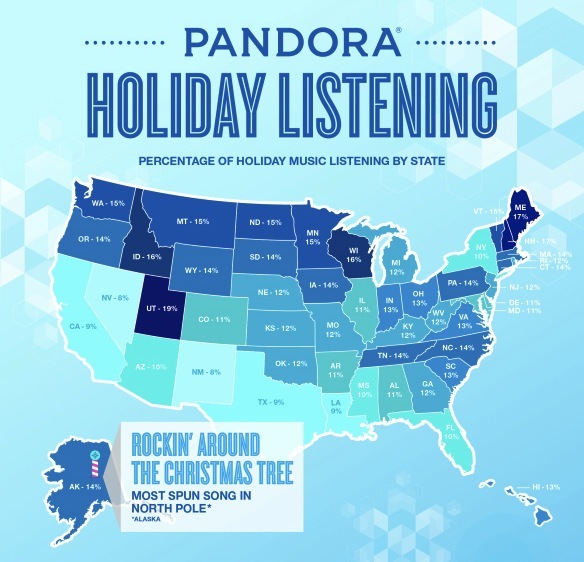 Nineteen percent of Utah&apos;s Pandora users stream Christmas music throughout the holidays, well above average. The numbers only reflect Utah&apos;s broader commitment to Christmas. It stands to reason — Utah is the most Christian state in the United States, according to a 2010 study, with 78% of its population identifying as Christian. (This data includes "Mormons and Unitarians/Universalists who self-identify as Christians," according to the Huffington Post.) Several psychological studies have found that people who focus on the holiday&apos;s Christian ideals, such as compassion, selflessness and family, are far more likely to enjoy the holiday than those who merely focus on the secular element, like candy canes and Christmas Eve sales. They&apos;re probably more likely to believe in the message of Christmas music too, rather than just get irritated by it. And as a result, the state shows an outsized amount of Christmas cheer well beyond music. Christmastime is news in Utah, where local outlets, like KSL News and 24 Salt Lake, draw up interactive maps to show Utahns where the lights are brightest. Utah also has one of the highest rates of snowfall in the U.S.; Alta, Utah, receives about 546 inches a year, so people there are pretty much guaranteed a white Christmas. Consequently, they&apos;ll have more time to stay inside to listening to Christmas playlists on Pandora. Across the board, more northerly states like Utah have significantly higher percentages of Christmas music listeners than warmer states to the south. It&apos;s probably a bit easier to get in the spirit when you&apos;re covered in snow, but that theory doesn&apos;t hold true for everyone: New Yorkers still seem pretty much ambivalent to Christmas music — they have a 10% streaming rate compared to Utah&apos;s 19%. But thanks to Pandora, jaded ex-Christmas lovers now know where they should go to get in the spirit. A little trip to Utah may be all you need to restore your childlike sense of Christmas magic.